All dogs must have up-to-date vaccinations. Owners must submit written proof from their veterinarian of DHPP and Bordetella vaccinations. Rabies is required for puppies and dogs over 4 months of age. Bordetella vaccines are required every 6 months. All dogs must be in good health. Owners will certify that their dog(s) are in good health and have not been ill with a communicable condition in the last 30 days. Upon admission, all dogs must be free of any condition that could potentially jeopardize other dogs, including fleas or ticks. Dogs that have been ill with a communicable condition in the last 30 days will require veterinarian certification of health to be admitted or readmitted. All dogs must be non-aggressive and not food or toy protective. Owners will certify their dogs have not harmed or shown any aggressive or threatening behavior towards any person or dogs. 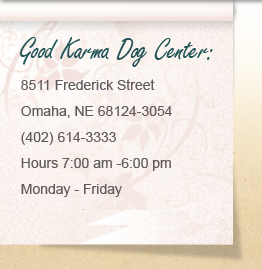 The safety and health of all the dogs at Good Karma Dog Center is our concern. All dogs must have a complete up-to-date Application on file to attend daycare. All dogs must undergo a temperament test performed on the first day your dog attends daycare. Cost for temperament testing is $20. Good Karma Dog Center reserves the right to dismiss any dog from daycare, boarding or training should the dog show aggressive or threatening behavior at any time.